This is a multi-sports session taking place at Loughborough Leisure Centre inspired by the Mencap 'Round the World Challenge' (RTWC) initiative. People with learning disabilities can join in with a variety of ball, target and team games, and update their progress 'Round the World' - visit https://www.mencap.org.uk/about-us/what-we-do/mencap-sport to find out more about the RTWC. 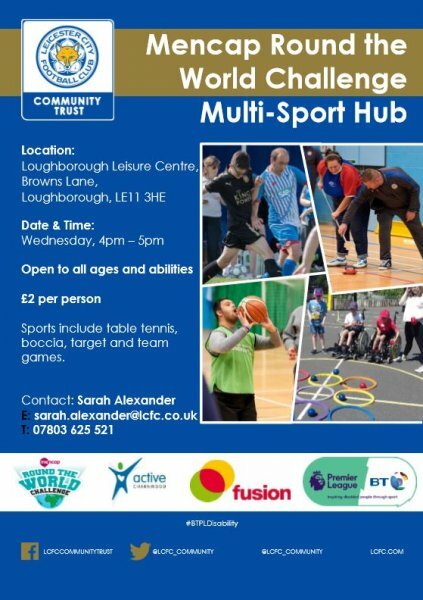 The session will include a variety of sports, which may vary, but typically will include Table Tennis, Boccia, target games and team games. The session is delivered by the great coaches of the Leicester City FC Community Trust team. Cost: The session is £2.00 per participant, with carers attending without charge.